Premium seats to three performances of either opera or ballet at The Stars of the White Nights 2019 International Ballet and Opera Festival, at the famous Mariinsky Ballet and Opera Theatre in St Petersburg. Verdi's I masnadieri (a new production from Teatro alla Scala and Director David McVicar) and Rigoletto at the Savonlinna Opera Festival performed in the medieval Olavinlinna Castle. Premium seats to Verdi's Masnadieri and Rigoletto at the Savonlinna Opera Festival performed in the medieval Olavinlinna Castle. Premium seats to three performances of either opera, music or ballet in The Stars of the White Nights 2019 International Ballet and Opera Festival, at the famous Mariinsky Ballet and Opera Theatre in St Petersburg. This luxurious 5-star hotel is situated on the waterfront with beautiful views of the Royal Palace and Gamla Stan, Stockholm’s old town. It is located next to the National Museum. The hotel is home to the classic Veranda Restaurant, renowned for its traditional smorgasbord, and to the large, elegant Cadier Bar which makes the most of the fantastic views over the harbour, Old Town and Royal Palace. The 5-star Hotel Kämp is housed in a beautiful 19th-century building, and is centrally located in the heart of Helsinki, opposite Esplanade Park, a 6 minute walk from Helsinki Cathedral and a 10 minute walk to the Boulevardi shopping street. The spacious rooms combine historical elegance with modern facilities and the Kämp Spa offers a traditional Finnish sauna, steam bath and a spa lounge. Conveniently located in the heart of St. Petersburg, the luxurious 5-star Art Nouveau Hotel Astoria, built in 1911, is directly across from St Isaac’s Cathedral, and is a short walk to leading attractions such as Nevsky Prospect, Palace Square and the Mariinsky Theatre. The hotel has a cafe, a cocktail bar and an upscale Italian restaurant, and an elegant afternoon tea is served. Amenities include a full-service spa, an indoor pool, and a 24-hour gym. 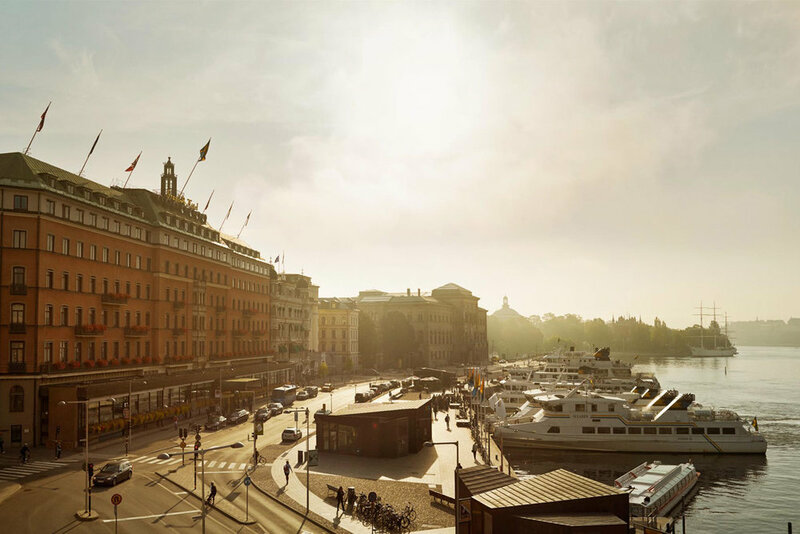 We arrive at our luxury 5-star hotel, situated on the beautiful waterfront in central Stockholm, and settle in. In the morning we take a guided stroll through Gamla Stan, Old Stockholm, founded in 1252, and one of the largest and best preserved medieval city centres in Europe. Our walk winds along narrow winding cobblestone streets, taking us to the Stortorget, a public square and the city’s historical centre. It is lined with beautiful 17th and 18th century buildings, the most impressive being the Börshuset, the former stock exchange built in the 1770s, and now the Swedish Academy, the Nobel Library and the Nobel Museum. After our walk we return to the hotel for a short break and then in the afternoon we travel by coach to Drottningholm Palace, one of Stockholm's three World Heritage Sites. We go on a guided tour of the Drottningholm Palace Theatre, one of the few 18th-century theatres in Europe that is still used as a theatre with its original stage machinery. We spend some time enjoying other features of the palace, such as the Chinese Pavilion and the imposing Baroque gardens. After we return to the hotel our evening is free. This morning we have a guided tour of the Stockholm Royal Palace, one of the largest palaces in the world. It is the Swedish King’s official residence and the daily place of work for the King and Queen as well as for the various departments that make up the Royal Court. It is built in baroque style and modelled as a Roman palace. The more than 600 rooms are divided between seven floors with a state apartment facing the city and smaller living rooms facing the inner courtyard. In addition to the Royal Apartments there are three museums steeped in regal history: the Treasury with the regalia, the Tre Kronor Museum that portrays the palaces medieval history and Gustav III's Museum of Antiquities. After the palace tour we travel to the island of Djurgarden, where we visit the fascinating Vasa Museum which, with its over a million visitors a year, is the most visited museum in Scandinavia. In 1628 the Vasa, a 69 metre-long warship sank in the middle of Stockholm on its maiden voyage. It was salvaged in 1961 and painstakingly restored for almost 50 years. More than 95 percent of the ship is original, and being decorated with hundreds of carved sculptures, it is an art treasure as well as an historical delight. A coach will take us from the museum to board the overnight ferry to Helsinki. In the evening we enjoy dinner on board. In Helsinki we have breakfast on board and then a private coach takes us to view some of the architectural wonders and best-known landmarks in Helsinki. These include the National Museum of Finland, an example of national romanticism, and Finlandia Hall, an iconic multi-purpose building designed by world-renowned Finnish architect, Alvar Aalto. We see Finland's imposing parliament building which combines neoclassicism and early 20th-century modernism and we visit the remarkable Sibelius Monument, which showcases a three-dimensional experience of the music of Finnish composer Jean Sibelius. We see the Helsinki Music Centre, an example of modernist architecture, which is a concert venue with a soundproof glass exterior and an open interior. We visit Temppeliaukio Church, built inside a massive block of natural granite, where natural light floods the interior through 180 vertical glass window panes that connect the dome and granite wall. We also visit the round wooden structure that is the ecumenical Kamppi Chapel. After our introduction to Helsinki we arrive at our luxurious hotel, Hotel Kämp, conveniently located in the heart of Helsinki, opposite Esplenade Park, a 6 minute walk from Helsinki Cathedral and a 10 minute walk to the Boulevardi shopping street. Our afternoon and evening are free. This morning we enjoy a private guided walking tour which emphasises the rich history and culture of Helsinki. Our stroll includes the main entrance of Helsinki Central Railway Station, classified as an example of Art Nouveau architecture, but containing features that would later come to define Art Deco, the Finnish National Theatre, built in the style of National Romanticism, and the impressive neo-renaissance Ateneum Art Museum. 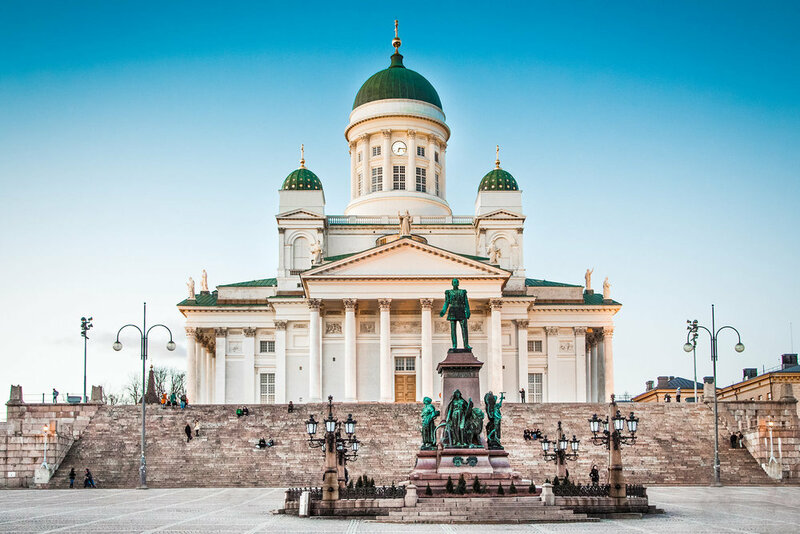 We stroll along Esplanadi, alive with markets, music and performers, and then visit Helsinki Cathedral, an imposing neoclassical-style building and the Eastern Orthodox Uspenski Cathedral, its Russian-Byzantine architecture modelled on a 16th-century church near Moscow. Uspenski Cathedral is a spectacular sight from the city, and from the cathedral there is a panoramic view of the city below. Our tour finishes in a busy Market Square, situated near the city centre and on the shore of the Gulf of Finland. Here there are shops, restaurants, food stalls and local wares. This morning, after a late departure, we drive to Lake Tuusala and visit the homes of three members of an important community of Finnish artists and musicians who lived here in the early 20th-century. Our first visit is to Halosenniemi, the lakefront residence and studio of Pekka Halonen (1865-1933) painter, in the national romantic style, of Finnish landscapes and people. Initially Halonen’s home and studio, it is now a gallery and home museum. We then visit the villa of Jean Sibelius (1865–1957), composer and violinist of the late Romantic and early-modern periods. His home, Ainola, named after his wife, Aina, is the house where Sibelius died and is buried. We will have a private guided tour of Ainola. Our final visit is to Villa Kokkonen, the fascinating home of composer Joonas Kokkonen (1921– 1996). On arrival at the Villa we have a delicious home cooked lunch followed by an artistic guided tour. Following our visits we relax in our coach as we continue our journey to Savonlinna in the heart of Finland’s lake district. On arrival we check into our hotel, Sokos Hotel Seurahuone, conveniently located on Savonlinna’s Market Square, right by Lake Saimaa and a short walk from the medieval castle of Olavinlinna where the opera festival takes place. In the morning we will attend a talk by Elizabeth Hayllar which focuses on tonight’s performance of Verdi's I masnadieri at the Savonlinna Opera Festival. We then enjoy a leisurely private guided walking tour around the centre of Savonlinna, which is built on islands close by Olavinlinna castle and Lake Saimaa. The tour includes the town market place and Linnankatu, the old city centre with its cobbled streets and picturesque wooden buildings. We then visit medieval Olavinlinna Castle, built as a fortification to protect the strategically important Savo region by repelling Russian attacks from the east and holding control of the Savo region for the Swedish Crown. It is not a huge castle, but it is beautifully preserved and quite impressive sitting on an island located amid spectacular lake scenery. The afternoon is free and, in the evening, we attend the opening night performance of Verdi's I masnadieri of the Savonlinna Opera Festival. Founded in 1912 this is the Finnish cultural event which is best known internationally, and it attracts an annual total audience of around 60,000. The opera performances take place in the great courtyard of medieval Olavinlinna Castle, a unique auditorium with excellent acoustics which is protected by an awning from wind and rain. In the morning we attend a talk by Elizabeth Hayllar about the second performance we will hear at the Savonlinna Opera Festival, Verdi's Rigoletto. We then enjoy a cruise on Lake Saimaa, Europe’s fourth largest lake and the heart of Europe’s largest lake district. It is renowned for its outstanding natural beauty as well as for the sanctuary it gives to certain endangered species. In summer the lake offers a panorama of rich blues and vibrant greens. Narrow straits lead to open waters sprinkled with forest-covered islands and quiet beaches. The lake is surrounded by rocky cliffs and the typical woodland of cold temperate regions which are dominated by taiga and forests of birch, poplar, and conifers. The afternoon is free and, in the evening, we attend our second performance of the Savonlinna Opera Festival, Verdi's Rigoletto. This morning we set out in our private coach on our journey to St Petersburg in Russia. It is fascinating and enjoyable to travel from Finland into Russia across the northern glaciated landscape, with its many lakes and forests. We will break our journey with lunch. In the afternoon we arrive at our luxury 5-star hotel, Hotel Astoria, in central St Petersburg and settle in. In the evening we enjoy a delicious dinner featuring Russian specialties. The afternoon is free and while there is a private coach to return you to our hotel, you might like to remain at the Hermitage after our guided tour to pursue your own particular interests in art, or to browse among the treasures. In the early evening Elizabeth Hayllar will give a talk on the performance we will see this evening. We then attend an opera, concert or ballet performance at The Stars of the White Nights 2019 International Ballet and Opera Festival, which is the prestigious main event of the year at the famous Mariinsky Ballet and Opera Theatre. We have time for lunch and, on our journey back to the hotel we have a guided coach tour to see some of St Petersburg’s famous landmarks, including the Bronze Horseman, an equestrian statue of Peter the Great, Saint Isaac’s Cathedral, the largest Russian Orthodox basilica and the fourth largest cathedral in the world, the Peter & Paul Fortress, original citadel of St. Petersburg, and the Church of the Spilt Blood, a colourful Russian-style church. In the early evening we attend a talk on the performance we will see this evening with our Tour Leader, Elizabeth Hayllar. We then attend an opera, concert or ballet performance at The Stars of the White Nights 2019 International Ballet and Opera Festival. We return to the hotel and the afternoon is free. However, if you choose you can be driven to the Nevsky Prospekt, one of the best-known streets in Russia and the city's foremost shopping street, where you might like to spend time strolling and shopping before you return to the hotel in your own time. Please note: The festivals will announce their 2019 programs in late 2018 and early 2019. There may be some changes to the itinerary depending on final confirmation of evening performances. 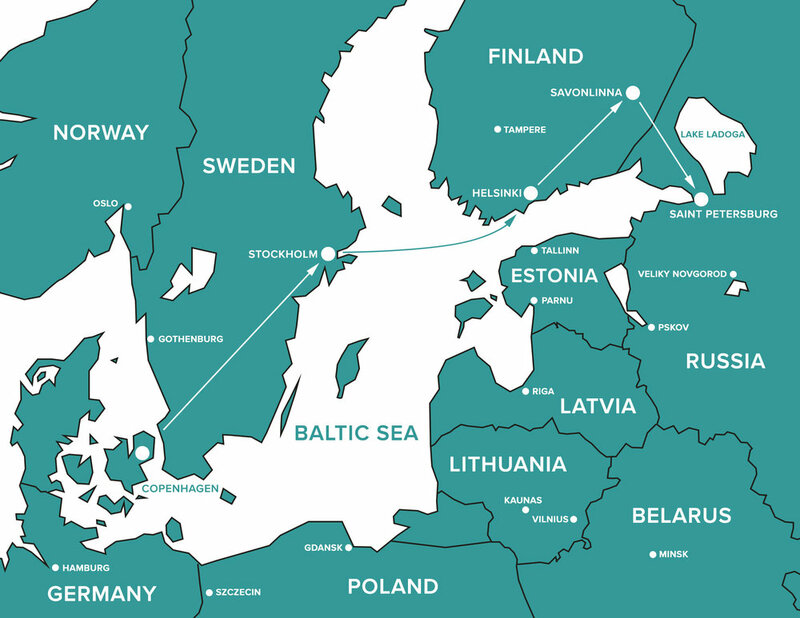 Performances: Premium seats to three performances of either opera, music or ballet at The Stars of the White Nights 2019 International Ballet and Opera Festival at the Mariinsky Ballet and Opera Theatre in St Petersburg and to two operas in the Savonlinna Opera Festival performed in the medieval Olavinlinna Castle. Please note: The venues and festival will announce their 2019 seasons in late 2018 and early 2019. There may be some changes to the itinerary depending on final confirmation of evening performances. Meals/Drinks: Full buffet breakfast each morning. Six lunches/dinners with wine, soft drinks and tea/coffee. Visas: American passport holders require a visa for Russia. The visa will be obtained by Hayllar Music Tours and is included in the tour price. This tour is now sold out. If you would like to register your place on the waitlist, contact us on contact@hayllarmusictours.com, call us on +1 (0) 917 720 3529 or complete the form below. 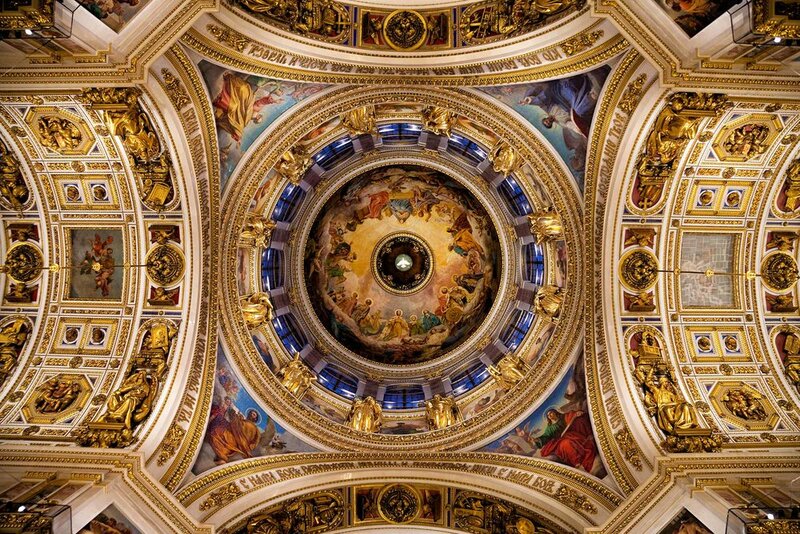 Thank you for registering your place on our waitlist for Opera, Music, Art & History in Scandinavia & St Petersburg with Hayllar Music Tours.